You see the city plows do it all the time. They roll through the neighborhood in their massive trucks and push mountains of snow onto the curbs. If they can do it on the roadways, why can't you do it on your driveway? 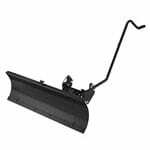 With the proper parts and a little bit of know-how, you can turn your lawn or garden tractor into a snow plow. This is a general guide, and should not take the place of your tractor and plow blade user manuals. Make sure to remove the spark plug or disconnect the battery before you begin working. You certainly don't want anything to accidentally turn on while your hands are in the mower deck. 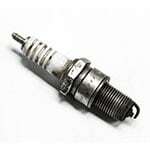 So make sure to, at the very least, remove the spark plug. However, we recommend also disconnecting the battery. Make sure your tractor is on a level surface so it doesn't roll on you, then lower the mower deck. Remove the attachment bar(s). Refer to your tractor's owner manual to determine how this is done. You may need to remove the deck from the PTO, disengaging it from the drive shaft. Once everything is disconnected from the mower deck, slide it out from under the tractor. Drape the chains over the tires, allowing them to hang down the front and back. 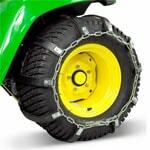 On the inside and outside of the tire, secure the locking mechanisms together to secure the chains in place. To ensure that they're properly secured in place, drive the tractor forward and back and inspect the chains. First, you'll have to attach the plow bracket to the front of your mower. This may require installing a subframe. Many plow attachments include multiple types of subframe parts to fit multiple types of tractors. Reference your user manual to determine which parts to use, then secure them in place. Lift the plow onto the brackets. This may require an extra set of hands. Secure the blade according to the user manual. Connect any hydraulic hoses and secure into place, then gently pull on the hoses to ensure proper installation. You can either install a rear weight bracket with weights, or you can use wheel weights. Which kind of weights you use may depend on the type of tractor you have, but adding more weight to the back end of your tractor will help hold the wheels and chains tightly against the ground. Check your work first. Go through your user manual again, making sure each step of the instructions has been completed accurately. Try moving parts to ensure they're fully tightened, and visually inspect each part. Once you're finished inspecting your work, you can try raising and lowering the blade. 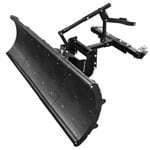 Try using the manual or hydraulic lift mechanism to raise the blade off the ground. Then take it for a test drive. 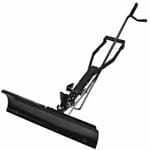 Need to Install a Snow Blower Attachment? Yup, we've got an article on that as well. Take a look to find out how the process differs from a snow plow blade attachment. Making Your Tractor Into a Snow Plow.. Our Power Equipment Direct how-to library can help you learn about Top-Rated & Best-Selling Three-Stage Snowblowers, Farmers Almanac Winter Weather Predictions and Proposition 65 Product Labeling.